This month’s drops include a range of hyped sneakers including the likes of Court Purple and Pine Green Jordans, Off-White Nike Blazers, numerous Yeezy reruns, maybe sneakers from the Adidas x DBZ collab, and more. While it may not interest you to cop each and every one of those kicks, we’re adamant you’ll want to get your hands on the Will Smith x Air Jordan 5 Grape this September! There are so many feels with this release it’s crazy. Whether you were a 90s kid or not, you know who we’re talking about. Will Smith is huge! During his six years as the Fresh Prince of Bel-Air, he’s made millions of viewers laugh, cry, dance, and even a little jelly of the sneakers he wore. Furthermore, the Jordan 5 Grape was one of the first sneakers he wore on set in 1990 when the series was first starting. And now for his 50th birthday, Will Smith is working with Jordan Brand to release the beloved colorway. Will Smith wore countless Air Jordan 5s on the screen. But the Jordan 5 Grape is a classic colorway. The mix of Grape Purple and New Emerald is the epitome of the 90s. And much like he styled them in the show, the upcoming Jordan 5 Grape will release in a laceless fashion. The last retro of the Grape in 2013 released with laces, however. 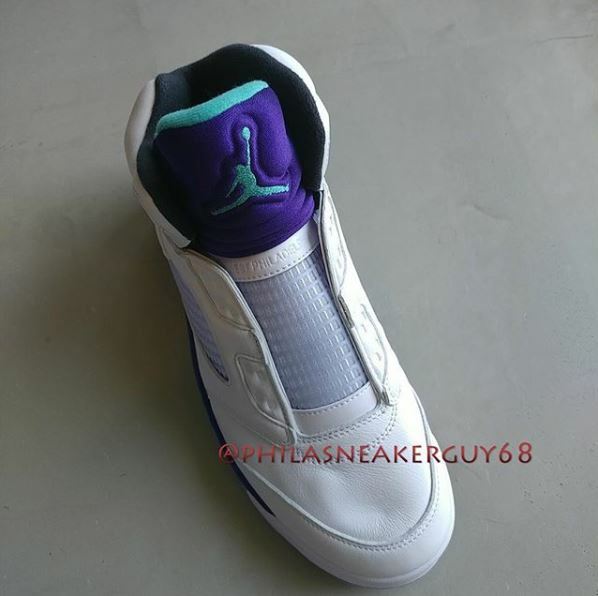 Undoubtedly, more details are being added to the latest version of the Jordan 5 Grape. The sneakers will drop in a Will Smith x Nike pack which also includes two t-shirts and 2 hoodies. According to sneaker leakers, the graphic on the merch will have a picture of the Fresh Prince. On the tongue reads “West Philadelphia” and the insoles got pink and green to match the Fresh Prince of Bel Air theme. Expect this pack to release on Tuesday, September 25th (Will Smith’s birthday) for a retail price of $190. In other news, which Adidas x Dragon Ball Z shoe are you planning to cop this month? Let us know in the comments below!